The Ultimate Guide to Ulaanbaatar, Mongolia For my birthday this year, I decided to “treat” myself to a solo trekking trip to Mongolia. The point was to go somewhere that was completely different from the usual birthday destinations that typically include a beach and lots of yummy cocktails. Mongolia has been on my Bucket List for some time now, so I put some plans in motion and had one of the most memorable trips ever! Mongolia may not be on your immediate list of destinations, but it should be! Here’s the blueprint on navigating the country and two blogs to show my personal experience! Mongolia is a North Asian country nestled between Siberia, Russia, and China. While not precisely sharing a border with Kazakhstan, Mongolia is not too far from the nation whose ethnic population form a considerable portion of its people. The landlocked country (2nd largest in the world in fact) is the birthplace of several ancient nomadic empires like the Xianbei, the Rouran amongst others. Despite being unapologetically Asian, Mongolia’s proximity to Russia has resulted in its being heavily influenced by the nation. The written form of the Mongolian language features a lot of Russian characters; even the architect shows a heavy Russian influence. There are only a handful of airlines that fly in and out of Ulaanbaatar, the capital city of Mongolia. One of the shortest routes is through Beijing, China. It’s best to book your flight from China to Ulaanbaatar before arriving in Beijing. If you have a long layover and want to get a 24 hours visa to China, you need to show proof of your ongoing destination. Once you arrive at the Ulaanbaatar airport, it’s effortless to grab an official cab service (that use meters), an “unofficial” cab (you’ll need to have excellent negotiation skills for this), or have your accommodations arrange it for you. My first stop in Mongolia was the capital city, Ulaanbaatar. It is also the “coldest capital city in the world.” As the largest city, Ulaanbaatar is home to over half of the country’s population. The most popular location in Ulaanbaatar is Sukhbaatar Square. If you arrive at Noon, you’ll have a fantastic opportunity to see the “Changing of the Guards” (I think) in front of the Government Palace. Other prominent buildings in the Sukhbaatar square are the Central Cultural Palace building, the State Ballet and Operations house, the Ulaanbaatar City Administration building and several others. Ulaanbaatar's most popular site for tourists is the “Black Market.” Apparently, at one point you could get anything here from machine guns, ammo, military gear, etc. If that is still true, that isn’t something I saw. However, you can get everything at the Market from warm clothing, boots, furniture, rugs, and more. Just a note, a lot of the “brands” you’ll see are knockoffs. If your bartering skills are up to par, you’ll have so much fun! Mongolia’s most famous icon is Genghis Khan or Chinggis Khaan, who is the founder of the great Mongol Empire. Because he is known as one of the greatest warriors that ever ruled, the Mongolians are very proud of him. There is a HUGE statue dedicated to him outside of the city. Mongolia is inexpensive. Period. My greatest expense was when I booked my trekking trip to the Gobi desert. Other than that, food, accommodations, and transportation are reasonable. Ulaanbaatar is like any major city. There are major hotels chains, boutique hotels, guesthouses, and hostels. It’s really up to your taste and budget. My only suggestion would be to stay in the heart of the city, so you can walk to all of the places you would want to visit. Mongolia food is hearty. It’s a lot of meat (mostly mutton), wheat noodles, stews, dumplings, etc. I’m not sure, however, I believe since its so cold, Mongolians consume heavier foods to stay warm! The Mongolians are pleasant people. Being a Black woman traveling in the country, I never felt unsafe, people didn’t stare, and a few struck up friends conversations. There were a few who wanted to take photos (like these guys below), but they weren’t creepy about it! Ulaanbaatar, while striving towards modern civilization has managed to hold onto its ancient traditions. This is obvious in its architecture and its pride in its rich history. It’s a safe city but isn’t exactly a place you want to spend more than two solid days. Everything there is to see and do can do be in a full day. 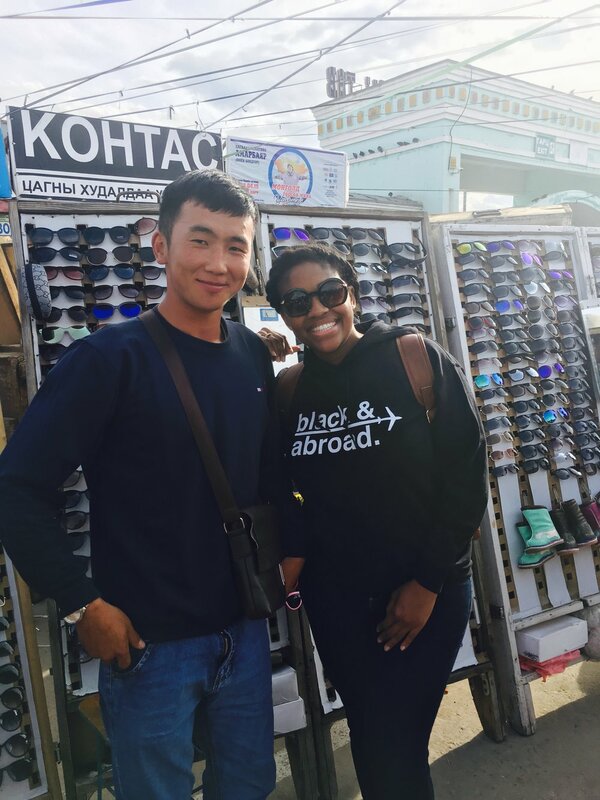 Below Is A Blog Of My Time in Ulaanbaatar, Including The “Change of the Guards,” The Black Market, and more! Have you ever wanted to go to Mongolia? What did you know about Mongolia? What To Do In Riga, Latvia [VIDEO]!